Barrie McKay drillsd the ball into the net following some dreadful Hearts defending. Picture: SNS. There is little doubt that Ian Cathro’s first game in charge of Hearts definitely witnessed some fresh ideas and a new direction in team strategy. Within opponents Rangers, that is. Under Mark Warburton there has often been a feyness to the Ibrox side’s football; at their worst, all possession and all-too-little propulsion and purpose. Not on Saturday. And though Barrie McKay’s incisive impishness was to the fore, the more rambunctious Rangers was best epitomised by Joe Garner. The Lancastrian left the field on Saturday to a standing ovation, with his team two-up and heading towards a points haul that has consolidated their status as second-best team in the Premiership. He did not have a hand in either goal. However, the dreadful defending from the Tynecastle men that allowed Rob Kiernan to net with a header and a throw-in to bounce its way to McKay to slam in just after the break, might have been part accountable to the duffing up Garner gave to a back four in which centre-back John Souttar and Igor Rossi were liabilities. Garner, pictured, is some people’s idea of an unreconstructed 1970s throwback centre-forward, whose dirty tricks make the Trump presidential campaign appear virtuous. Certainly, he leads with the elbow – he received his obligatory caution for drawing blood from Perry Kitchen – and in equal measure throws himself into challenges and throws himself to the ground looking for penalties. Yet, he is giving Rangers an edge, a physicality, that has allowed them to bump out of their way runners-up challengers Aberdeen and Hearts in recent weeks. Perhaps it is no mere coincidence that he only arrived on the field late as the club’s solitary defeat in ten league games was inflicted on them at Tynecastle a week-and-a-half ago. Notably, Garner didn’t deny that Rangers against Hearts were prepared to do the dirty work that he seems to thrive on. “We played Hearts away and they tried to make it a physical game. I think we matched them here. But we’re a good side, we’ve got some good footballers, some very good young players. I thought Barrie was exceptional on the wing and we stood up to them. I felt we deserved the three points. Showing an aggressive drive away from home is what has thus far largely eluded Rangers. Hamilton on Friday provides them their next opportunity and it is a game that Garner will go into seeking to improve his tally of three goals from ten league starts and four substitute appearances. 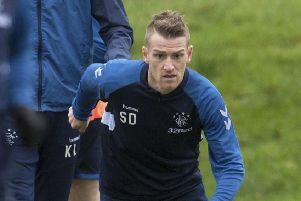 Stating, as he has from day one of his Rangers career, that he enjoys a scrap with centre-backs, he isn’t troubled by the fact that he has more cautions – four – than goals in the colours of the Ibrox club. This is a man who, after all, racked up 12 yellows and one red for his previous club last year, and has amassed a total of 77 bookings and two dismissals in his career. He doesn’t feel a marked man by Scottish referees. It was all too hard for Cathro to make the desired impression in his first outing, but he sought to downplay the significance of the events. He pledged that Hearts were a better team than they were on “the grass” at Ibrox. He has to show that to prevent the club sliding to the fourth place that owner Ann Budge said would not be very good after their third place last season. Those who sought to present the appointment of Cathro as either visionary or vainglorious seemed to overlook that you require to see what it actually brings before deciding it is one or the other.